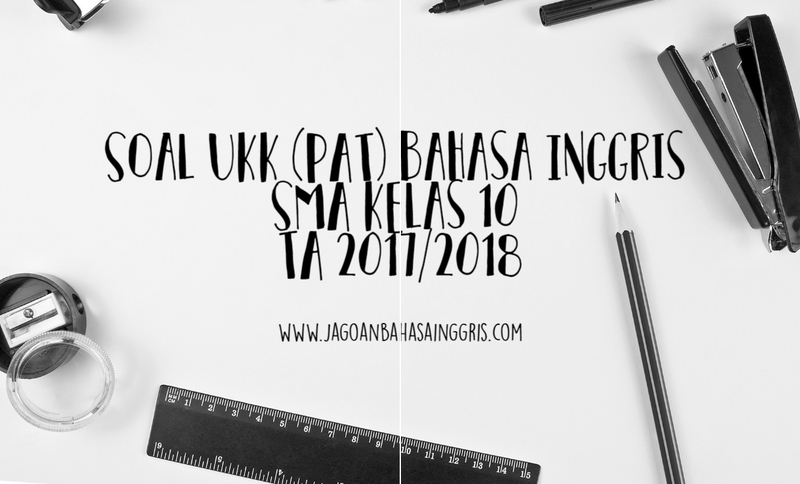 Tidak terasa akhir semester 2 sudah dekat, teman-teman semua pasti tidak sabar menunggu kenaikan kelas.Untuk mengatasi kecemasan kalian dalam menghadapi Ujian Kenaikan Kelas nanti kami ingin memberikan Soal UKK (PAT) Bahasa Inggris SMA Kelas 10 TA 2017/2018 agar teman-teman semua mendapatkan nilai yang bagus pada semester 2 ini. Untuk para guru juga, kami sangat senang jika artikel ini dapat membantu dalam pembuatan soal UKK di sekolah bapa dan ibu guru sekalian. Untuk mengunduh soal, silahkan scroll terus kebawah. Read carefully and choose the right answer between a, b, c, d, or e! 1. Lina : "What do you like to do in your spare time?" Ratu : " You know, I'm a mother to be.So I like ............... and gardening"
3. Dhani has just got his master degree. His parents want to celebrate it next week. Rio : "I'm glad to come. Could I bring my girlfriend?" a. I need your help in my party next week. b. Can you distributes these invitations for me? c. My parents need some help from you for next week. d. I'd like you to come to my party next week. e. We'd like you to help me distributes the invitation. 4. The party will be held ............... Saturday, June 23, at 7 pm. 5. Alika : "I'm Sorry. I and Nuri missed the morning flight. It made ............... late for your wedding party"
6. Doni " I have forgotten my pen again. 7. Waiter : "What would you like to drink?" Customer : "I like ............... fresh water better than tea." 8. Rosi : "What will you do after passing the final examination?" Dini : "If I ............... the examination, I will continue my job." 9. Nunik : "Is Amir able to play badminton?" Dudi : "Yes he is. He ............... play badminton very well"
10. Zeta : "What are you doing mom? Are you cooking?" Mom : "No, but I ............... dinner before father ............... home"
11. Keisha : "What lesson do you like?" Dimas : "I like maths"
Keisha : "Maths is ............... lesson I have ever learnt." 12. Father : Which one do you want for your birthday present Ria? A pair of shoes or a dress?" Ria : "I'd rather have a dress than a pair of shoes." 13. Stranger : "...............where is the nearest hotel from here?" A girl : "Please, straight ahead along the street." Sept 90 - April 93 : Grammar School, Gasport Hants 9 O level GCEs. July 93 - Oct 93 : Hermes Academy, Eastbourn Speed writing 130 wpm. Typing 35 wpm. My speed writing is now poor. My typing speed is 70 - 80 wpm. Reason for leaving: Full time receptionist returned. July 94 - July 97 : Thomas Abbot Ltd. London. Stared as a junior audio typist. After 9 month became PA to branch manager. Left to return to Eastboune for personal reasons. 15. How long did she work for an insurance company? 17. Where did she work form July 94 - July 97? Show runs from 9.00 a.m. to 4.00 p.m.
18. What is the type of the text above? 19. Where will the event be held? 20. What time does the reception end? Hydroponics is an unconventional growing technique. It is the cultivation of plants in water. The idea of hydrophonics comes from assumption that plants do not need soil. They need only the nutrients and moisture in the soil, and these can be supplied through gravel beds that contain water. Hydrophonics is not a new process. As long ago as 1690, an English physician tried growing plants in water in a laboratory experiment. In 1800 some German researchers used the method to develop many of the formulas for plant nutrient solution which are still used today. About generation ago, hydrophonics moved out of the research laboratory into commercial use. In 1936 a California physiologist, W.F Gerick, published a guidelines for hydrophonics agriculture. One of the leading companies in the field of Hydrophonics is Hydrophonich Incorporated of Glendele, Arizona. It produces more than 2,7 million kilogram of fruit and vegetables each year mostly tomatoes, but also cucumbers, lettuces and melons. Crop yield are excellent for example each nature tomato plant produces an average of 12,1 kilos of fruit a year of two growing cycles. These companies with about 9 kilos for two crops of the average soil grown plant. Everything is carefully controlled in the green house; the temperature, the humidity, and the air circulation, wind, hail, frost, drought, weeds, and insects are all excluded. In recent years, hydrophonics farming has been expanding in many parts of the world. A hydrophonics farm operated by the government of Kuwait produces fresh tomatoes at a desert site near the capital city. At Puerto Penasco, Mexico, and Sadiyat Island Abu Dhabi, experimental hydrophonics farms use sea water that is desalinated by special installment located on the coast. 21. When were hydrophonics invented? 22. Where does the leading company of hydrophonics come from? The word they refers to? Questions 25 - 29 refer to the following letter. I'm Sorry that I have to turn down your invitation. I'd give anything if I could go with you, but my Dad needs me at the store. Since nearly all of his clerks are on vacation. I have to stay around to help out. I hope that you and your family have a good trip. 25. Why did Elva write the letter? 26. Why couldn't Elva go with Sulis? 27. What does the word turn down means? 28. Why were some clerks absent? 29. What is the synonym of the word nearly? 30. Tono : Can I know your birthday? Jika ingin mendownload soal diatas silahkan klik link di bawah ini yaa.